As the oldest city in the United States, St. Augustine is a northern Floridian vacation destination. Filled with centuries-old history, 40-plus miles of spectacular beaches and nightlife options, this city has been entertaining visitors through the ages. Dating back to 1565, the city of St. Augustine has been featured in family albums across the world. Showcasing history, architecture and outdoor fun through its landmarks, restaurants and historic heritage, visitors from around the globe put St. Augustine on their vacation list annually. The Lightner Museum will present an exquisite collection of 36 original costume pieces seen on the award-winning television series Downton Abbey®. On its final stop of a highly successful tour which began at the Biltmore Estate in February 2015, Dressing Downton: Changing Fashions for Changing Times™ will be presented in the museum’s Grand Ballroom Gallery. As the USA’s oldest city, St. Augustine is a vacation destination that draws visitors from all over the world. Steeped in history, natural beauty and a wealth of interesting sites and attractions, the Ancient City offers an unforgettable experience to people of all ages. Whether you’re here for a weekend getaway, a romantic escape or an extended family vacation, fall is one of the best times to discover all St. Augustine has to offer. A pedestrian-only thoroughfare, bustling St. George Street is the epicenter of downtown St. Augustine. Chock full of shops, restaurants, art galleries and attractions, this historic street is a must for any visitor to the Nation’s Oldest City. Hello, I’m Dave Chatterton, General Manager of Old Town Trolley of St. Augustine. With nearly 500 years of history, including rule by Spain, Britain, and the U.S., St. Augustine is full of sights and attractions that entertain and educate. 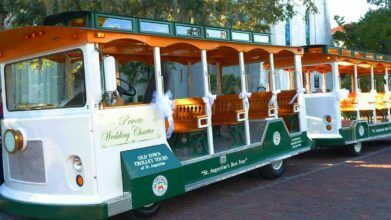 For over 30 years, Old Town Trolley Tours has provided St. Augustine sightseeing tours highlighting the best of the city. Hop aboard one of our trolleys and you’ll experience Transportainment, a delightful combination of transportation and entertainment. St. Augustine’s rich history and natural beauty make it one of the best vacation spots in Florida. From pirate lore to appetizing eats, a vacation in St. Augustine is both memorable and enjoyable. If you’re looking for a unique sightseeing experience in the city, read on to find out about hidden gems and one-of-a-kind adventures in St. Augustine. Escape to St. Augustine during the winter for fun in the sun and an abundance of activities, events and attractions. The nation’s oldest city, situated right on Florida’s east coast, tends to have very mild temperatures while the rest of the country experiences snow. Here are some of the top things to do in St. Augustine during winter. Springtime is one of the best times to visit America’s oldest city. The summer heat hasn’t arrived and there’s a lightness in the air. St. Augustine is home to many unique sights, pristine beaches and historical points of interest. Here are some of the best things to do in spring in St. Augustine. What better place to study Liberal Arts than inside an oasis of architectural beauty? Flagler College, situated on the grounds of the original Ponce de Leon Hotel, offers students 29 majors and four-year degrees in several dozen areas of study. Established in 1968, Flagler College is a private, liberal arts institution of higher education. The school has been ranked by US News and World Report as well as The Princeton Review as one of the best regional colleges in the southern United States. The college is named for industrialist and railroad magnate Henry Morrison Flagler who built it in 1888 as a hotel. It is considered one of the finest examples of Spanish Renaissance architecture and was one of the most exclusive resorts of its day. Explore the darker side of the Nation’s Oldest City and let our Ghost Host be your guide. Face your fears in Potter’s Wax Museum’s Chamber of Horrors and then ENTER the Town’s most haunted building, the “Old Jail,” for an up close and personal encounter. Don’t miss this frightfully fun riding tour! You won’t want to miss this Ghost Tour! It’s the only ghost tour that takes you inside Two of the city’s most haunted buildings! Elegance and history, grace and sophistication all come together in the glorious rooms, walkways and exhibits at the Lightner Museum. Originally The Hotel Alcazar, the building was built by railroad tycoon and hotel developer Henry Flagler and is a magnificent example of Spanish Renaissance architecture. Browse through costumes, furnishings, mechanical musical instruments and collections that bring back the grand Gilded Age, a marvelous period in the 19th century. See beautiful works of cut glass, Victorian art glass and the celebrated work of Louis Comfort Tiffany. Tour the museum and take a historical journey that will not soon be forgotten. When visiting Villa Zorayda, make sure to leave yourself a good hour to explore this architectural and cultural gem. It’s been added to the U.S. National Register of Historic Places and houses one of the most unique collections of antiquities in America. Such rarities on display include the “Sacred Cat Rug,” which is over 2,400 years old and said to be made from the hairs of ancient cats that roamed the Nile River. You can also see hand-carved tropical hardwood furniture and impressive interior details like the flooring and windows. Constructed by Henry Flagler, the Grace United Methodist Church is a lovely site and a place of special interest in the Old City. Its Spanish style, terracotta spire and moldings are a continuing reminder of the impact of Spain on the entire city. Located at 8 Carrera Street, the Church was built in the late 1800’s, and was added to the United States National Register of Historic Places in the 1970’s. Services are held here throughout the week and visitors are welcome. An incredible adventure for kids and adults of all ages, the Pirate & Treasure Museum offers visitors a chance to journey back to the era of the Golden Age of Piracy. This unique museum showcases one of the largest collections of rare pirate artifacts in the world including Captain Thomas Tew’s 17th Century Treasure Chest and the Journal of Captain Kidd’s Final Voyage in 1699. The Scenic Cruise company was founded more than a century ago when Frank Usina and his wife settled in North Beach, which at the time was only accessible by boat. In the early days, Frank would ferry guests of the Ponce de Leon Hotel and Alcazar Hotel back and forth from St. Augustine to North Beach, showing them the beautiful sites along the way and treating them to oysters, Minorcan cuisine, music and dancing. Walk in amazement and wonder as you see more than 800 exhibits at Ripley’s Believe it or Not Museum. Everything from the weird and unusual to the exotic is on display and ready to excite and entertain people of all ages. The museum is the original Ripley’s Believe it or Not, opening in 1950 just a few months after Robert Ripley’s death. Here, people can explore and interact, witness incredible illusions and see for themselves what Ripley collected from his travels around the world—many too outlandish to believe. Like so many other sites in St. Augustine, the Lighthouse is a cherished landmark from another era. It’s significant for two main reasons—first because of its role as a vital watchtower that led ships safely into the St. Augustine port for more than a hundred years and second because of its longstanding survival as an architectural icon to the city. The original lighthouse was closed in 1874 on the same day that the new one was completed. For a truly memorable experience while visiting St. Augustine, take a whimsical ride on one of the various Horse-drawn carriages. Enjoy the breathtaking views of the Castillo de San Marcos and the activity in the picturesque harbor as you enjoy a nostalgic step back to a simpler time—horse-drawn carriage rides throughout St. Augustine are just one of the many ways visitors can relive the history of our nation’s oldest city. The Schooner Freedom gives its guests an opportunity to experience a sail reminiscent of an authentic 19th century Blockade Runner. St. Augustine’s own tall ship, the Freedom was constructed in 1982 and is a double masted 72’ replica of the topsail ships of that time. Choose a fun-filled day sail or relaxing evening cruise—your two hours on board this spectacular vessel will include music, sightseeing and perhaps even manatees, dolphins and other friendly wildlife. Situated along the Atlantic Ocean, St. Augustine’s pristine beaches stretch from Vilano Beach north of the city to Crescent Beach in the south. With dozens of public beach access points peppered along the coastline, there is a bit of something for everyone. From horseback riding, sunbathing and stand-up paddle boarding to fishing, diving and volleyball, the endless miles of white, sandy beaches have made St. Augustine a go-to destination for water lovers and beachgoers. The Spanish Military Hospital Museum offers visitors a look into how healthcare operated during the Spanish Colonial Period. The building that the museum is housed in is a reconstruction of a Military Hospital that was on the same site in the late 1700s. As you tour the museum, you’ll be given an inside look into how patients were treated here. From the ward beds to the surgeon’s tools and even the mourning room where patient’s last rites were given by Priests, the museum is an interesting and unique spot to see. Potter’s Wax Museum is located on Orange Avenue in historic St. Augustine and offers visitors a unique opportunity to see some of the world’s most famous people up close. The figures are known for their remarkable likeness to the characters they represent due to the process that’s used to create them. The eyes are handmade in Germany and the hands are sculpted in Belgium. According to historians, St. Augustine is believed to be the birthplace of American wine dating back to 1562. And so it only makes sense that one of the country’s premier wineries, San Sebastian Winery, would call the Nation’s Oldest City home.